The harbour was built in 1831 by James Bremner, the eminent harbour builder, ship raiser, ship builder and ingenious inventor, who was born at Stain, Keiss, on 25 September 1784 and died at Wick on 12 August 1856. He received an apprenticeship in a Greenock shipyard and after making two transatlantic crossings he returned to Wick to establish his own ship-building company. During the next fifty years he constructed over 50 vessels as well as designing and building many harbours in Eastern Scotland. A three storey former fishing store still stands beside the harbour. This has recently been converted into high quality holiday accommodation. Other traditional stone built houses sit above the harbour whilst the village itself stretches all the way back to the main road. 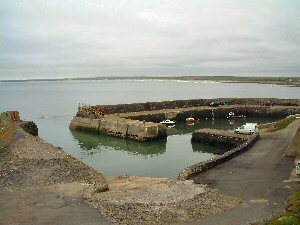 The harbour is still used by several small creel boats.